“The reason we selected those rooms is because the audiences were so hip. We could just play what we wanted to play and everybody dug it, you see.” With its book-lined walls, high ceilings and brightly coloured carp swimming in a pond set in the floor, the People’s Republic in Sydney’s Camperdown might not be the kind of venue Cannonball Adderley had in mind when he spoke of “being hip.” But for pianist-composer Colin Bright and his Syzygy Band—performing a quirky set of improvised works—the receptiveness of an audience eager to embrace the unusual and experimental is no doubt an important part of the venue’s charm. 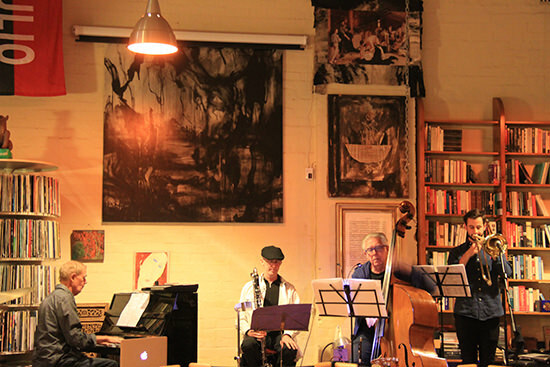 Bright and Syzygy had opened this concert of shaped improvisations—lightly supplemented with electronics—with the colourfully evocative Bird of Sticks. Repeated piano notes become Messiaen-like figures, Bright’s reverb generating beating dissonances. Piesse’s drumsticks clack against each other before his palette expands to encompass rims and frames. Noam Jaffe’s violin joins piano and kit in a driving rhythmic groove, but the balance is uneven and he’s swallowed by the other instruments. Piesse switches to brushes, caressing cymbals and skins, the electronics a smokey haze. One hand on the piano keys, Bright leans over to control effects on his laptop. Polovineo’s gravelly trombone punctuates the mist before a bass clarinet line emerges in a warbling, avian solo. Cutlan’s didjeridu-like bass clarinet screams and cackles the throaty laugh of a kookaburra. Bird of Sticks fades to a gentle acoustic finish, a sheen of delicate harmonics. 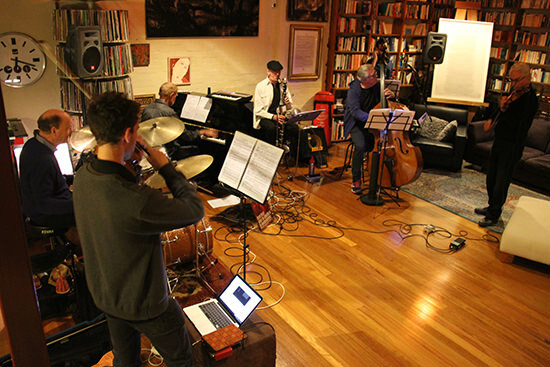 Earthly Tones is a tribute to the late jazz bass player and band-leader Charlie Haden—the title a critic’s description of the jazz legend’s playing. Ellis’ bass yields soft harmonics. His sound has an earthy richness as he draws primal, animalistic moans from the bass while Piesse’s fingernails tap over skins. The bass cries like a dolphin, the texture thickening as Jaffe adds sliding harmonics and Piesse switches once more to brushes. Guttural, repeated notes and chords add layered harmonics before Ellis settles into a walking bass-line. The bass clarinet growls and buzzes, the music a relaxed swing, a crisp tap of percussion against gurgling electronics. Ellis’ fingers dance nimbly in the high register, before a sliding descent into muddy tremolos marks a return to the ambient harmonics of the opening. Experimental violinist Jon Rose joins the ensemble for The Threepenny Violin. Bright introduces the piece: “I like fences and shapes but Jon just wants to be free.” This tension plays out in a furious improvisation bound together by samples of playwright Bertolt Brecht giving evidence in 1947-48 before the House Committee on Un-American Activities. Rose propels the music forward with a flourish of crunching pizzicato, his bow bouncing radio static on the strings. “Bertolt Brecht” repeats over and over again. The music is a devilish hoedown, flecked with slapstick comedy and frenzied energy, the voice of the interrogator needling: “Are you now or have you ever been a member of the Communist party of any country?” Chaos splinters into moments of lyricism with quiet impressionistic piano from Bright. Rose declaims loudly in German. A militant snare drum heightens the sense of anxiety and the bass clarinet lends a cabaret festivity. Rose’s bow shredding reaches a fiery climax: the band cuts off, leaving the violinist alone to play a blistering cadenza. Light taps from the drum-kit gradually bring the other instruments back in for a lighter, swinging conclusion. The encore, however, is contemplative. 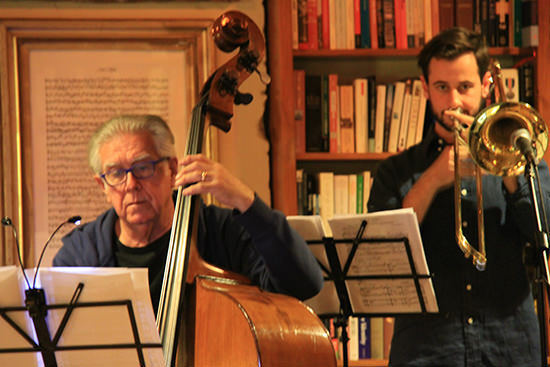 Moon Over Long Reef —originally for piano—sees Jaffe trace a plaintive violin melody, ambient with vibrato, before Cutlan sweeps his bass clarinet from the instrument’s rumbling depths to a high register with the honeyed tone of an alto saxophone. Colin Bright and Syzygy’s set burst with high-energy, high-intensity play, resurrecting the sounds of history in a quirky romp, under the surface of which lay a deeper exploration of music-making and politics. Whether or not the experience could be defined in terms as nebulous as “hip” and “the real jazz audience,” the listeners at the People’s Republic were clearly eager to play their part.